Wrightstyle is a specialist steel and aluminium glazing company and supplies its fire-rated systems internationally. In light of the UK’s heightened terrorist threat level, Jane Embury, the company’s marketing director, looks at some of the risks. The UK Government has raised the terrorist threat level from substantial to severe, meaning that an attack is highly likely. This is the first time in three years that the threat level has been so high, and reflects the current unstable situation in Syria and Iraq, and the issue of returning Islamist fighters holding UK passports. In its many regional and international aspects, terrorism is something that we have grown to accept; that the ideologies of intolerance are something that can’t be contained within the Middle East or North Africa, and that they pose problems we may have to face for decades. The US Department of Defense defines terrorism as ‘the calculated use of unlawful violence or threat of unlawful violence to inculcate fear; intended to coerce or to intimidate governments or societies in the pursuit of goals that are generally political, religious, or ideological.’ It also makes the point that in 2013 terrorist attacks globally rose 43%. The Security Service (MI5) makes the point that terrorist cells are increasingly looking at less-protected ‘soft’ targets, including social and retail venues, tourist sites and transport networks. In other words, pretty much everywhere that large numbers of people congregate. Tackling terrorism is, of course, a huge and complex task, involving governments and government agencies worldwide. It’s about proactively seeking to understand, and then disrupt, terrorist activity. But it’s also about passively, through building regulations and building systems, creating built environments that are more resilient to terrorist attack. At Wrightstyle, a leading European steel and aluminium glazing company, we have become industry leaders in determining the best ways in which glazed systems can withstand the enormous pressures exerted by a terrorist bomb, because the main cause of injury and death from a bomb attack is flying glass. In an attack using explosives in an urban area, between 80-85% of all secondary blast injuries are caused by flying glass. When a bomb detonates, it produces gases at very high temperatures. This in turn leads to a rapid expansion of air and the creation of a shock wave travelling at supersonic speeds. The shock wave lasts only a few milliseconds and is then followed by an equally sudden but longer-lasting drop in pressure. It’s the enormous impact of the shock wave and the subsequent suction that shatters the glass and distorts the framing. Overall, blast injuries result in mortality ranging between 7.8% in open air to 49% in a confined space. A majority of victims (70%) will sustain soft tissue injury, and traumatic amputations will occur in approximately 11% of cases. Most people killed or badly injured in a blast involving high-order explosives (HE) are affected by either primary or secondary blast injuries. Primary HE blast injuries are caused by high-pressure gases from the explosion rapidly expanding to produce a supersonic blast wave. This has devastating effects on human air-filled tissue, particularly the lungs and gastrointestinal tract. Primary blast injuries are generally fatal. Secondary blast injuries caused by flying objects, for example glass fragments, are much more common than primary blast injuries and are the most usual cause of death in blast victims. The penetrating injuries occur most often in the exposed areas of the body such as the head, neck, and extremities. The Wrightstyle system’s strength was achieved through a glazing technique that bonds the glass to its framing support, so that in an explosion the components work together to safely absorb the shock and retain the glazing elements. In many instances, untested combinations of glass and frame are specified separately – despite the fact that, in a fire or blast situation, the glass will only be as good as its framing system, and vice versa. In comparison, Wrightstyle’s system is a compatible, complete and tested glass and steel framing system. 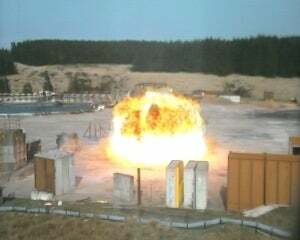 While other manufacturers often ‘test’ their systems using computer modeling, we invested in ‘live’ testing, the most significant being a charge of 500kg of TNT- equivalent explosive adjacent to the glazed assembly, which is a size of explosion associated with a lorry bomb. Our live testing was carried out at a secure, specialist facility in the north of England. We followed the simulated lorry bomb with a simulated car bomb attack (100kg of TNT). The lorry bomb was detonated 75m from the test rig, while the car bomb was detonated at a distance of 20m to produce a higher pressure loading and shock on the façade and was also successful. In addition, our systems are aesthetically no different from non-fire or blast systems, giving architects the ability to design buildings using glass, glass and more glass. It is a significant step forward because, while it is not stopping terrorism, it is limiting the damage that terrorism can cause, both to property and, importantly, to life, and therefore helping to thwart its very raison d’être.